So what caused us such frustration, discouragement, and great angst in our first year of marriage? Theology. Yes, theology. For years as single people, we both felt that God could use us. We felt free to pursue God, to know him and to respond to him. For years, God had led us both to take initiative, to lead, to speak publically, and to use our gifts. Then, marriage came and confusion hit. People at seminary thought I (Leslie) would stop simply because I was now married. People insinuated that only Chad should get direction from God for our family. How was this supposed to work when God gave me a mind and heart for vision, future thinking, and entrepreneurship? Why when single did we both have the ability to lead in projects and then married, everything was supposed to change for me? I was to simply help Chad. It made absolutely no sense. And it made me think deeply. Had I made a mistake? Did God have more access to me single than he did married? Our discouragement and confusion led us to search Scripture deeply. We went to God and told him that as we studied, we would surrender to whatever he showed us. God quietly encouraged our hearts with John 8:32, “You will know the truth and the truth will set you free.” We realized that either way, God would provide freedom – either freedom to accept that leadership is one-sided in marriage, or freedom to understand that together God could use us as a powerful co-leading family. So our search began, and it has truly set us free. Eventually, we both pursued doctorates of missiology and both studied more in depth about male/female relationships in both the home and the church. Through this series I want to share with you some highlights of things we discovered in our research by God’s Spirit. Thankfully, we found that we were not alone in our search and that many other evangelical believers were seeking Jesus and his perspective. This brief post looks at a few truths found in Genesis 1-2 where we find life before the fall, before sin, before brokenness. In Genesis 1-2 we see God’s ideal family. Please note that these are brief statements, and we could expand on the first two chapters of Genesis for several hours (or pages). Here, I am simply giving a brief summary. Pristine Perfection – God created people in perfect harmony with God, with one another, with self, and with the earth. Shared Origin – God created both male and female in His image. In Genesis 1:26-27, we find the plural form. “Let us make human beings in our image, in our likeness… So God created human beings in his own image, in the image of God he created them; male and female he created them.” God created humanity to display community and unity as displayed by the Trinity. Shared Duties – In Genesis 1-2, God gave the man and the woman mutual blessings and responsibilities. We find in Genesis 1:28 that God issued five commands to both the man and the woman: procreate (feru), multiply (rebu), fill the earth (mileu), subdue (kibesh), and rule (radu) the creation. Therefore, God calls each person who bears his image (and that would be all of us) to serve and rule as faithful and responsible stewards over this world. A “Strong” Word… ezer k’neged – In Genesis 2, the writer gives a more detailed and hands-on account of creation. In Gen. 2:18 we find that the man could find no ezer k’neged among all the animals. The English translation often translates this as a “suitable helper.” However, I want to explain what we learned as we examined these two Hebrew words. It was staggering. The word ezer in Hebrew is a noun that denotes strength, not weakness or secondary status. Writers of the Old Testament used this exact word ezer twenty-one times in the Old Testament. Sixteen of those times it was used to describe God – since God provide help to Israel or David or the weaker party! Three times it was used to describe the militaristic help Israel needed from stronger nations. Two times it referred to the husband/wife relationship in Genesis 2. The writer of Genesis placed the word k’neged in front of the word ezer, meaning “corresponding to, equal to, like a mirror, or beside.” The phrase, ezer k’neged, does not indicates a woman’s lesser or weaker status, but an equal one! The original listeners to these words immediately realized that the woman was a “strength equal” to the man in God’s ideal family. When Chad and I realized that God’s original design placed man and woman together as equal strengths, we knew that God wanted us to be side-by-side, following God’s guidance to make a difference in the world, stewarding the world together. Love, celebration, joy, unity, and harmony describe Genesis 1-2 as God created and then commissioned both male and female to serve as co-regents. 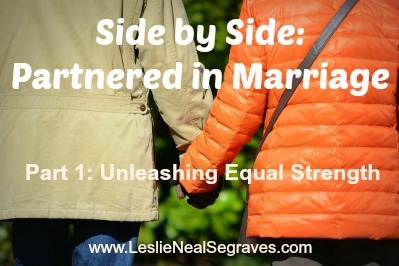 Of course, chapter 3 came next and things changed, but what Chad and I grasped from Genesis 1-2 set us on a path seeking to allow God to create this “equal strength” relationship between us for the sake of stewarding the world. As we uncovered these theological truths, some of our tears dried and a new co-mission became clear. Join me on Wednesday as I start a series on power and how power was given, then distorted, and later redeemed by Christ in the context of the male/female relationship. Join the conversation: As a woman or as a man, how are you living out the strength God created you to be? Thank you SO MUCH for starting this series! I’m very excited to read the wisdom God has given you and Chad about marriage. I’m getting married in May and my fiance and I have the same perspective about the Biblical basis for co-leadership and partnership in marriage, which has been wonderful. However, the couple we are doing marriage counseling with has a very different view in terms of marriage roles. They have challenged us to search out scriptures and, while we both are secure in what the Lord has shown us about equality and co-leadership, I am excited to learn more about this with Mason. It has become apparent pretty quickly that I don’t know anyone here who really shares this view of co-leadership, so it will be encouraging to read your posts. I have a specific question about the pre-fall marriage though. The couple we meet with brought up the idea that in Jewish culture, the first born assumed a position of headship. They used this to support the idea that men have headship over women because they were created first. (as I read in Why Not Women? this could also mean that grubs have headship over humans…) But I would like to know your thoughts on this. You told us about circular reasoning in Jewish stories and arguments (as opposed to Greek linear reasoning), which may apply here? I’m not sure. Also, the question I’m asked over and over again is “but when you have a disagreement and you both can’t find common ground, who does the buck stop with? Who has the final say?” This is usually said in the context of “where do we spend the holidays this year” or “which small group do we join” caliber decisions. In your marriage, have you run into this problem of needing to delegate a final decision maker? Do y’all take turns? Glory, thanks so much for sharing your exciting news about your marriage that is coming up! Thanks also for your questions. I appreciate them and know that your questions are being asked by so many and were asked (or are) asked to us still 17 years later! 1. Jewish culture and Primogeniture preeminence – Couple of thoughts about this. First, in narrative theology (which is what stories in the Bible are), we are to seek to understand what God is seeking to tell us about himself through the stories. So in my doctorate, I studied David for example. In a primogeniture society, the oldest son was the leader. However, God chose David to be King. What was God trying to tell the readers/listeners about himself in this choice? Or Jacob? Or Joseph who rescued his family and rose as a leader in Egypt. So maybe the Jewish culture did hold to the oldest was the leader, but God continued to shatter this idea in the biblical texts. Of course, in 1 Sam 16:7 we see that God looks at the heart, not the external. 2. In the Genesis 2 narrative, a few structural things we can notice. Your point about the grub being created first (or vegetation, or light) exactly describes the fallacy of prior preeminence in God’s design. This is further described in Why Not Women (D. Hamilton). The “book-end” parallels in Genesis 2 start with creation of male and end with creation of female, which in the Jewish grammatical structure, would be seen as equal/redundant/poetic/ and corresponding. 3. Though the Jewish people later held to primogeniture priority, it was not this way “in the beginning.” Genesis 1 and 2 contains a vastly different relational structure than post-Fall (see Gen 3:16-17). If nothing changed, then why mention these things? Jesus also showed that “in the beginning” was different than the Mosaic law in Matt 19. Jesus’ reference point was not the Jewish cultural reality, but God’s initial intent – which is shared dominion. 4. At a later time, I/we will do an article on “kephale/rosh/head” and some corresponding thoughts. 5. The good ol’ “where does the buck stop?” or what if there is a disagreement? I love your question because they indicate that theology must be made practical – how does it affect my life? How am I to live this out? So, no, in our marriage we do not have a permanent and gender-based “final decision maker.” Another way may work for some families, of course, but our way works also. We are both seeking Christ and desperately want him to guide us! We seek to serve one another – we listen to one another. We hear each other’s thoughts. We seek Christ alone and together. One thing we have realized is that very FEW decisions are life and death decisions in marriage. We can truly pursue John 17 – the unity Jesus prays for. We can take time to make many decisions. Sometimes we have told the other, “This decision will affect you more than me. So I really want you to know that I will support you in what you decide.” Other times one of us has said, “I have prayed and I just don’t have more time to think through that. Either way is fine for me.” Just being male or just being female does not determine final decision maker in our family. Hearing from God trumps it all to be honest. If I or Chad truly believes God has made something clear, the other one of us prays to confirm and then we move forward unified. As you said the decisions are not usually that large and yet can really hurt a marriage (like holiday choices!). What we did for holidays was this. Thanksgiving Day is always with C’s family; we travel 5 hours to get there. My family adjusts. Christmas I want to be at our house for the night before and morning and early afternoon on Christmas day since we have kids and if we are in the states, and then we go to my parents who live in the same city for a few days and have a big slumber party.  We do his house before the actual day. We have made it work. It was pretty tough for me at the beginning of marriage bc I am close to my family, but over the years, this model has worked well for us. Again, Glory, these are quick answers. I can tell you that after 17 years of marriage, a “two-headed monster” does not rule our house since we do co-leadership. Rather, we both believe our individual relationships with Christ are vital so that we might together hear Christ and move quickly. And our kids are watching what it looks like to see a team in action – with Christ as the coach/quarterback/empowerer! Sometimes I catch the ball and run and Chad guards me and runs with me. And at times Chad catches the ball, and I guard him/run with him. We are a team, and we have to keep huddling up and getting directions for the next play, but our goal is to advance side-by-side. All the best with the upcoming marriage! Can’t wait to meet him. I love this post and the questions and responses! Beautiful questions and beautiful answers! Thank you Jinna! Thanks for visiting!